The Cumberland & Dumfriesshire Farmers Mart P.L.C. 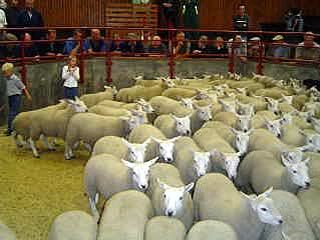 had forward 1,712 store hoggs & in lamb ewes at their weekly sale at Longtown on Tuesday 30th March 2010. Store hoggs were dearer to a top of £91.50 for North Country Cheviots from Carpet Farm, £87.50 Moorhouse; Texel £80.50 Parks, £79 Carpet Farm; Greyface £79.50 Baron House; Suffolk £77.50 Carpet Farm, £75.50 Haithwaite; Half Bred £73.50 Adderston Shiels; Hill Cheviot £70.50 Crosscleugh, £68.50 Blackwood Ridge; Blackface £68.50 Mains of Collin, £65.50 Haithwaite; Herdwick £53.50 Whitehopefoot. Cast ewes to £107 Alnham Castlehill. In lamb Blackface ewes scanned twins to £70 Milnmark.